well said. That’s exactly what groups like the BRC and other “wise use” groups would really like to see. Right on, public lands represent physical freedom & space. Without these lands, the west will turn into a vast urbanized human feedlot. Lest we forget the freedom to purchase and own land. The sign in the photo says “Private Property”. I do believe we retain the right/freedom to own private property in this country. To understand this the better, it is fit to consider, that every Man, when he, at first, incorporates himself into any Commonwealth, he, by his uniting himself thereunto, annexed also, and submits to the Community those Possessions, which he has, or shall acquire, that do not already belong to any other Government. For it would be a direct Contradiction, for any one, to enter into Society with others for the securing and regulating of Property: And yet to suppose his Land, whose Property is to be regulated by the Laws of the Society, should be exempt from the Jurisdiction of that Government, to which he himself the Proprietor of the Land, is a Subject. By the same Act therefore, whereby any one unites his person, which was before free, to any Commonwealth; by the same he unites his Possessions, which were before free, to it also; and they become, both of them, Person and Possession, subject to the Government and Dominion of that Commonwealth, as long as it hath a being. Whoever therefore, from thenceforth, by Inheritance, Purchase, Permission, or otherways enjoys any part of the Land, so annext to, and under the Government of that Commonwealth, must take it with the Condition it is under; that is, of submitting to the Government of the Commonwealth, under whose Jurisdiction it is, as far forth, as any Subject of it. I’m afraid that, in the interests of honesty, I must confess to fencing and posting my own property. I buy burned out ranches and work them back into shape. I don’t do it for the money; I could make more, especially now, doing other things with the time and the money. I do it to turn back time, undevelop them, and sop up the damage. I have lost count of the number of truckloads, tons, of garbage I have hauled off these places and these are in remote areas that most people would think were supposed to be wild. The sad truth is that, although I’m not against freedom and the American way and would honestly like to world to be like that, my property gets literally and completely trashed, or retrashed as the case may be, if I don’t fence and post. And, the problem comes in many forms. In western states with “fence-out” laws, the guy down the canyon would much rather herd his livestock onto my place and save his own grass for later. I like wildlife and have spent much time and money to bring the numbers way up on a couple of my places; I have elk and trophy pronghorn that have grown so used to being protected that I can walk within 30 or 40 yards of them before they move off and, when they do, they only trot out another hundred yards or so. It takes time and protective nurturing to get them that comfortable; but, with the mentality of today’s hunters, they would overwhelm and shoot out all of it in a matter of days if I didn’t fence and post and, even with fencing and posting, they cut my fences and march on in as they please. I’m regularly discovering poached carcasses, the majority killed out of season. Off-road vehicles, thrillcraft, are the worst and actually the primary reason why fencing and posting are essential. When they think they can get away with it, they still cut fences and run rampant. The motorcyclists are the worst in terms of the damage to the ground. Those skinny tires slice through the surface like knives and, every time they turn a corner, they seem to like to throw a rooster tail. The worst part in terms of my workload is that they can carry cargo, beer and liquor bottles and cans and plastic wrappers and so on. As a group, they haul lots of it in and only a little of it out. I get to haul out the rest and, frankly, I resent being the garbage man trailing them around and cleaning up after their backwoods debauchery (yes, I’ve had to clean those up too). On the few occasions that I have let hikers in, I can’t trust them to honestly agree to follow any rules or to be honest about their intentions. A few years back during the height of the drought, I was able to trace the path of one of these very agreeable fellows by the string of filter-tip butts he left. I understand that people get frustrated with closed private land; but, if you think about it, they often don’t support the public lands they have and many will and do trash the lands that they visit, whether those lands are public or private. I know it may make me unpopular; but, a big part of good stewardship is not exposing your land and the creatures that live there to the local motocross club or to be used as a shooting gallery or a garbage dump. mikarooni…..I support every reason you stated for posting and “protecting” your property. It’s appalling to see the disrespect so many have towards public and private lands here in Montana. From my experience on the rivers and trails, most of the folks that trash these lands aren’t the hated “out-of staters”, but the 3rd, 4th, 5th or whatever generations of Montanans who claim to have the “right” to dump their old stove, tires, beer cans, refrigerators etc into the rivers because this is “what they’ve always done and we have a right to do it.” I can tell you that visitors I know from other states that come here fly fishing, floating, hunting and hiking have nothing but respect and would never think about throwing a beer can into the river. I also happen to be one of the supporters of Huey Lewis (it’s not a popular position to take) and all of the restoration work he’s done on his property along the Bitterroot River. He’s enhanced both wildlife and fish habitat far beyond what FWP and others have done along that river. He’s constantly chastised for not allowing access. There are others like yourself who do work to enhance their land for the benefit of fish and wildlife. Thankyou for your efforts. In the United States we have the freedom to own land and to post “no trespassing” as the person in the photo has done. I should add, however, that this parcel of private land does block access to the public land behind it. America also has a large estate of public land, and there are those who would abolish it so that all land would be private. One of the privatizers is the recently disgraced Senator Ensign from Nevada. Our system of mixed ownership serves us well, but the freedom the public portion provides us all is too frequently ignored. I just got back from a long hike on part of yours and my public land. You are doing a very good thing, and certainly not in conflict with my view that our public lands are of great value in the enjoyment of our freedom. Ah, I should have guess by the lack of cattle in the background. Its sad that so much of Idaho is as beautiful as that, but yet remains inaccessible…thanks to the few who litter, leave trails, and lack respect. Folks, maybe I’m confused, but I thought Ralph was talking about the privatization of lands that are currently in the public domain, not private lands that have long been private, deeded property. The photo may be the cause of the confusion. I suspect (correct me if I’m wrong, Ralph) that the idea of the post is to make the distinction between the “closed” and inaccessible status of most private land, compared with the access the public has to public lands. It’s an exhortation to keep our public lands public, and not let the federal government (or state governments) sell off BLM, USFS, or state trust lands to help balance budgets, or for whatever bogus reasons some folks keep coming up with. Let’s keep out public lands public, cherish them, and fight to see that they are managed in a more responsible fashion, and cheer on those private landowners who take good care of their property. As the owner of a few acres of Chihuahuan Desert, I can certainly identify with mikarooni’s and jerry b’s comments. It’s amazing how many people look at desert land and see only a waste dump. That’s “our” public lands, of course. Typing was never my strong suit. You are correct in what I intended. I would not like to see signs like that on lands that the public has always owned. I’ve got a problem with the “fence-out” laws on my land on the interface between the Chihuahuan Desert & Chiricahua Mountains. It seems the local rancher & his livestock doesn’t have any respect for the fence I was forced to build, let alone my “private” property. you should see the fence-line some years ! I don’t post though, i don’t see any need – “my” dwelling gets used – a lot, but not by ORVers & eco-thrashers – mostly by refuges i suppose, who leave their trash – empty water bottles & bedding, which might offend some folks’ visual sensibilities – not us, we haul it out every year with reverence and hope. it’d be interesting to know whether i have the “private” right to block the road access that runs through my “private” land to the public lands the rancher’s livestock use. if anyone’s ever on public land hiking or otherwise recreating, make sure to take a map – i think one might be surprised how frequently fences to public lands are posted as private … i saw one just last week . Brian, I personally find the “fence out” laws pretty offensive in the first place. Why on earth should one have to fence out livestock, rather than the livestock owner fencing the animals in? Of course, the answer is twofold: First, the livestock industry has the political clout to keep this law on the books, and second, “it’s the way our grandpappy did things” so it’s just the way it ought to be. As for blocking public road access through private land to public land, this became a big issue in southern New Mexico a few years ago, when the BLM acquired a nice parcel of land with a scenic loop trail (non-motorized) in the Organ Mountains and a couple of owners of Mc Mansions flanking the only road access to the trailhead put up a gate blocking the road. The case eventually went to court and the property owners were forced to back down–although BLM did restrict the hours of access to something like 8:30 a.m. until early evening (sunset, or something like that)–which seemed reasonable. Can’t blame folks for not wanting cars with blaring boom boxes running in and out a hundred yards from their houses at midnight. The above discussion about trash and lack of eithics is so depressing. And every day there are more of those mindless littering fools. I am a hiker who always takes a trash bag w/me. As i live in Oregon where we have a deposit on cans, and more recently on plastic containers, many folks still litter the landscape and the worst of it all are those dam plastic bags. East Texas is pretty much private owners in small rural farms. I had a couple of friends who spend 2 weeks in 2000 looking for Shuttle parts from the crash. They spent 2 weeks walking thru private lands & were blown away by the amount of trash they observed. So much for the pride of private land ownership. I’m going to hazard a guess that your photo is taken somewhere between Soldier Mountain Road and Rock Creek, at the south end of the Smokies. It’s true there is limited access from the south, but I don’t know of any areas there that are completely landlocked by private ground. I don’t think it’s a coincidence that this section is the best wildlife habitat along the southern face of the Smokies – fewer weeds, weekend warriors and their dogs, and relatively gentle range with good soil. I’d argue that the private landowners are providing a public benefit (wildlife security) by restricting uncontrolled ORV access. The southern face of the Smokies has been overrun with machines in most areas. I’d disagree with the poster who claims that most of the trash comes from multi-generational residents…my experience has been that it comes from everywhere in about equal proportion. If I had a dollar for every energy bar wrapper or empty water bottle I found in the trail, I could do a lot for conservation. It seems to me that the most critical factor is whether there is road access or not. The cultural tradition of an area regarding trash disposal also makes a difference, especially in those rural and backcountry areas that do not attract many visitors from far away. I took the photo from the Willow Creek road looking west across the private riparian bottom land up towards the public (BLM and Forest Service) mountain. I totally agree with Ralph. When we’re out hiking and get about a half-mile away from a road, the volume of trash drops dramatically–although I suppose in areas with heavy ORV use, that may not be the case. My name is Brian Hawthorne. I work for the BlueRibbon Coalition. I talked to Professor Maughan the other day and mentioned I was a fan of his blog. I also said that I was sometimes tempted to comment, but was reluctant. Safe to say, my perspective on the subject matter isn’t at all like the norm. But Professor Maughan correctly noted that regular commenters here are reasonable folks, and while you all might disagree with my perspective, he encouraged me to chime in from time to time. What motivated me to finally offer a comment was his harsh criticism of Senator Ensign. My question is; if Senator Ensign is a “privatizer,” then what is Senator Reid? Isn’t it true that Reid’s Clark and Lincoln County land bills did more privatizing, and more development, than anything Ensign tried to do? Am I to understand that most folks here believe that no public land should ever be privatized for any reason? If not, then under what conditions can/should lands be sold? One thing that is regularly done here is beat up on Harry Reid. “KT” in particular likes to take him to task. Harry Reid is indeed a tremendous privatizer and he is more effective at it because he is leader of the U.S. Senate majority. One difference between Reid and Ensign is that Reid does has turned hundreds of the millions of dollars from these sales of BLM land sales back into recreation and purchase of already private lands than have high recreational, scenic, and wildlife value. In my mind that partially mitigates what he has done. Nevada’s Senator Ensign (back when he was representative Ensign) teamed up with ex-representative Richard Pombo of California to essentially allow mining companies unlimited ability to privatize BLM and some Forest Service public lands. Their proposal, which was sounded defeated by a number of Western Republican senators as well as the Democrats, gave nothing back to the public. At any rate, I think that both Ensign and Reid are not well loved among most who comment here. I’d argue that the private landowners are providing a public benefit (wildlife security) by restricting uncontrolled ORV access. The southern face of the Smokies has been overrun with machines in most areas. its also over-run with livestock. not a whole lot of wildlife security there. there’s been a WS trapper out there last week – apparently someone lost a calf – which is no surprise, they’ve got the livestock spread buckshot over the public landscape, including right near the Soldier Mountain pups, with no apparent herder or care – except to call Wildlife Services in. for those who hate the visual stimulation of trash – consider the sound of constant bawling of livestock looking for their calves from every which direction. then there’s the sheep – which got trailed through a couple of weeks ago. you wanna talk about weeds. those sheep tore it up something fierce. there’s a nice native peony in bloom several weeks ago. Right near where I live there is a big stretch of private land surrounded with barb wire and “No Trespassing” signs. Just on the other side, a half mile away, I can see public National Forest land. Easy walking distance except…..if I want to get to it I have to drive about twelve miles and then hike another five or six. At least I CAN get to it. I know of at least a few that the only way you can get to it is to fly in. I really believe that there should be a public land access law similar to the Montana stream access law. A simple easement between property lines would work. Regarding trash, I absolutely agree that the vast majority is near roads. Most people willing to hike a mile or two in seem willing to pick up after themselves (and sometimes others), in most of my experience anyway. Yep, there’s a lot of livestock all over the Smokies…all things being equal though, the absence of machines, dogs, and hordes of people is preferable. The cows are only there for a few months a year. I’m not defending them (or sheep) but as far as security goes, the impact of livestock is less than uncontrolled recreational use, both motorized and non-motorized. And you are right in another sense…the cows are a detriment to wildlife security when it comes to predators. As for the trash issue…I’ve found heaps of trash a heck of a long way from any road or trail. To the point where I wonder how anyone could have packed this much junk in here in the first place. I agree, back in the days when I could hike, it was amazing the amount of junk we use to pack back out of the Bob Marshal, I never understood how they could get that much crap in there! the impact of livestock is less than uncontrolled recreational use, both motorized and non-motorized. are you suggesting this as a general rule of thumb ? or as specific to this particular landscape ? i’m not sure it’s true in either case. ATV use pales in comparison to the ecological impact of livestock. it’s a simple matter of proportion. Sure, ATVs impact may be more immediately conspicuous – the impact may be more visually noticeable, ex: it’s easier to notice a straight line/unauthorized track than to see the multimillion hoof-prints, over-utilized vegetation (and all of the ecological consquences that result), alteration of species composition, denuded riparian, etc, that tear it up. but even the discrepancy of the ability to see the impact is not necessarily the case – if you know what to look for. say you’re walking up through a wet meadow, and you think to yourself, “wow, look at all that dense iris in bloom – it’s beautiful” – which is certainly the case, but the abundance/density of iris is probably an ecological indication that the landscape has been denuded by livestock, which prefer other species to iris, so they increase in proportion. this might not be a big deal except that iris displace other vegetation, and can be a pretty good indicator that a lot of species which better stabilizes the soil from erosion and provides other functions which boost the “productivity” and ability to sustain wildlife on the landscape have been denuded. the same is true on wet spots & even uplands with smooth brome, a grass that follows livestock disturbance – because livestock tend to prefer other, softer more palatable forage (i.e. native grasses). smooth brome will choke everything else out. one may look out at a landscape and say, “wow – there’s a lot of green grass – this site must be healthy” — when in reality the landscape is largely dominated by a coarse grass that snuffs out all the stuff wildlife prefer – i.e. the site has an inconspicuously diminished carrying capacity. or consider the kentucky blue-grass whose rhizominous roots adapt well to grazing pressure. so-well, that other vegetation with deeper roots, better able to stabilize soils/streambanks from erosion, are out-competed given the grazing pressure and vastly more soil/sediment loss characterizes the riparian area. downcutting, lowered water, upland species begin moving into what used to be wet places. the ecological integrity of these wet areas are critical to over 90% of species on a landscape. these are just a few examples that you might not notice – and it’s just the change in composition (it’s not even speaking to the huge quantities of removed/livestock-utilized grasses & forbes which would otherwise sustain much more wildlife). there are so many examples of just this vegetation response to grazing – larkspur … etc. — a response that has very large implications/consequences ecologically, to soil, hydrology, etc. there are other ecological consequences beyond a particular vegetation community’s response – so many of which are equally subtle in their immediate ability to identify-notice, but which have enormous consequences that significantly diminish the wildlife/fish carrying capacity of a landscape or fishery. but who would notice them ? we just notice that a landscape doesn’t look to have a whole lot of wildlife, or a fishery is crummy. we may not even notice that – because the landscapes response is so slow – it looks like it’s always looked – far as we can remember. and then you visit a place like Charcoal Creek in Copper Basin, or Democrat Gulch via Croy Canyon – or Lake Creek on the East Fork — and it’s like night & day. These are places where livestock has been removed for an amount of time. trading ATVs for Livestock is a disaster. Most groups have largely abandoned the livestock issue (ecology is too complicated to try to express/explain to membership). ATVs, a problem no doubt – but a relatively isolated problem ecologically, is an issue that is a lot easier to understand – to immediately see – and express to a conservation groups’ membership & philanthropic foundations. which is fine, we need oversight of ATV use. dispersed camping is a similar story – we see agency pointing to dispursed camping as a “real problem” all the time – and just as quickly turning a blind eye to the landscape level ecological devastation that livestock have inflicted on our public landscapes. all things being equal though, the absence of machines, dogs, and hordes of people is preferable. Thanks for your comments there…if you read my post again, I qualified my statement “as far as security goes”. Cows don’t hunt big game, or harass them during the birthing season. They don’t bother the birds near as much as we do, at least in my experience. I’ve almost ALWAYS seen more wildlife in secure, well-managed private ground (or adjacent hard to reach public), cows present or not, than on public ground open to uncontrolled recreation. I don’t dispute much of what you say regarding the ecological effects of stock, particularly your observation regarding the loss of forb and shrub diversity, which has been very evident on ranches that I’ve worked on. I’m not as much of a true believer as you are, having also been on many properties heavily grazed by livestock that have excellent diversity and loads of wild animals (in addition to visiting properties that are absolutely hammered), but livestock are just a tool that can be used for bad or good. I haven’t seen much ecological good come out of recreation, and I’ve lived in recreation-dependent communities for nearly 20 years. In short, rarely, the era of federal lands disposition ended in the 1930’s. However, if public lands must be sold then the public must get the fair market value, or the price of similar lands sold on the open market by private landowners. That is the same standard applied to federal takings of private lands so fair must be fair, right? Simply put public lands should never be sold, transferred, or exchanged for private gain. Private gain comes in the form of individuals who acquire huge tracts in exchange for small in holdings. 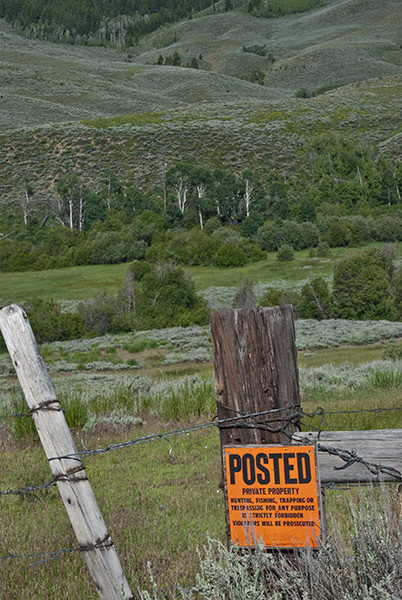 Less obvious private gain comes from virtual transfers that dedicate public lands to single user groups, such as grazing, mining, offroading or block access to other public lands through fencing and posting of small holdings. Just as I have no right interfere with my neighbors quiet enjoyment of their lands or prevent them accessing the street, a private user should have no right to interfere with public enjoyment of our lands or block access to public lands through strategic acquisition of small parcels. Exclusive access to public lands requires paying the public just compensation. If grazing is actually profitable that should be no problem. If exchange land is really equivalent in value then why be so secretive and underhanded? http://tinyurl.com/62fsvs And if atv’ers are so committed to their “sport” then they must pony up. Otherwise, multiple use is the law so treat these public lands as any property owned by others, with respect for others rights and respect for the fish and wildlife who call these lands home. Thank you for answering. Please forgive the delay in responding. 4. Formerly public lands that have been privatized must be managed under certain restrictions, including allowing public access, and the owners cannot use their newly acquired lands for one single use. Number 4 seems to me to be a problem, for obvious reasons. Unless I’ve misunderstood. Which is entirely possible. In any event, thanks for answering.